Don’t Get Blown Away in Blowing Rock! Our Blowing Rock T-Shirts are made from 100% pre-shrunk, high quality cotton and are available in five different colors. Our Blowing Rock T-Shirts are machine washable. Our Blowing Rock T-Shirts are available in both Men’s and Women’s. 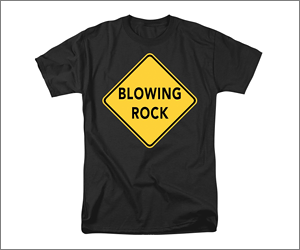 Blowing Rock T-Shirts Ship within 1–2 Business Days!